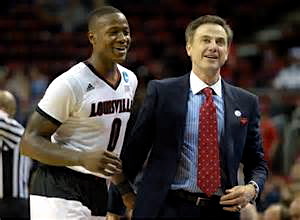 Terry Rozier’s 25 points made Coach Pitino smile as Louisville defeated UNI 66-53. Doctor, doctor check my pulse! It’s racing and I have the sweats. Actually that’s just the alcohol finally exiting my system after watching all the games over the last four days. It was outstanding to wake up in Kentucky on a day like Sunday. Winter has given way to spring, the Bluegrass is flowing, thoroughbreds are running and basketball is king across the Commonwealth. Adding spice to this already idyllic day was the NCAA basketball tournament, as its third round was concluding and the Sweet Sixteen would be set. Even before setting foot out of bed the air had an electricity to it, filled with the anticipation of the events yet to transpire. I got a team in the tournament man, and they’z playing 2day to advance to the Sweet 16! That is some righteous action brother. The first thing to do is get some team colors on my torso. Flash your colors. Let ’em know you’re there. These are one-and-done contests, you don’t want to chance luck. Get your colors on early and start talking smack. As the saying goes, survive and advance baby, survive and advance. That’s all that matters in the NCAA. Generally speaking any sports fan worth their salt has a specialty item they wear for luck. A shirt, a game jersey, some friggin’ obnoxiously striped set of overalls. It can be lucky socks. A hat. The boxers you wore the last time your team won a big game. It doesn’t matter. What counts is the ritual, and that it continues. I have a select set of game jerseys that only come out for post-season tilts. Certain ones can be worn for the early round games, others are reserved for Final Four games and championships only. And a t-shirt must be worn underneath to help keep them clean. You don’t want to wash one of these unless absolutely necessary – some of the luck might evaporate. My 2-year old daughter is starting to get in on the act as well. Isabella had her Kentucky colors blazing on Thursday/Saturday and sported red Friday/Sunday for Louisville. All weekend it felt like I was playing with house money. Didn’t matter what was going on before the game, it’s all good. Time slows the hour leading up to the tip. Traffic on the streets dries up to a trickle. Taking the dog for a walk I can hear the pregame telecast pouring out of neighborhood windows. You want to talk about must see television, check out Big Blue Nation on an afternoon anywhere in Kentucky when the Cats are playing to advance in the NCAA. Church is in session and Coach John Calipari is standing tall at the pulpit. But that was Saturday. What made Sunday so pleasant is that the Cats had already advanced to the Sweet Sixteen. The real pressure was off. This was a day when I could kick back and watch my other teams go full tilt boogie. Being born in Lexington to parents that both graduated from UK, the Wildcats are front and center, but Louisville is a close second. I’ve been a fan since Denny Crum, Darrell “Dr. Dunkenstein” Griffith and the McCray brothers roamed the court. Thirdly are my Iowa Hawkeyes, which is the university I actually graduated from, twice. The Black & Gold have a great sports tradition, particularly in wrestling, but in terms of football and basketball, there is a certain reasonableness factor that must be applied. Iowa has a built-in ceiling that keeps its teams from flying too high. That doesn’t prevent the Iowa City faithful from getting drunk as monkeys and swinging from trees anytime the Hawkeyes take the field, but it keeps my expectations realistic. Regardless, Iowa was in position to play for a spot in the Sweet Sixteen Sunday. All they had to do was get past No. 2 Gonzaga. I was hoping the Zags were slightly soft due to the lesser conference competition they faced. I was wrong. Gonzaga is a tall team with talent that can shoot the ball well. That is a combination that will serve them well in the NCAA tournament. The Zags got my Hawks down 10 early and kept pouring it on, beating them 87-68. While things didn’t end well for my Hawks, on the plus side I got to sport my Iowa jersey all day and give some love to my alma mater. The fact that Iowa won its first round game over Davidson was huge. When you’re a fan of the likes of UK or Louisville it’s easy to forget how hard it is to be good year in and year out. Iowa has been struggling to return to the land of college basketball respectability. This year they took a big step forward. The late game was a different matter. Louisville has had a rocky year, but remained a Top 25 team throughout. They were the higher seeded team Sunday and needed to win their contest to make it to the next weekend in Syracuse and provide a proper validation to their season. I believe The Ville is one of the 16 best teams in the country, but it was on Louisville to prove it. Thankfully the suspense was minimal as the Cardinals steamrolled the University of Northern Iowa 66-53. Some of that result had to do with the quality of athlete, but it’s also preparation and experience. This was a school-record fourth time in a row that Louisville had advanced to the Sweet Sixteen. It’s not possible for a team like UNI to replicate that kind of mental preparation. As a double bonus on Sunday I got to witness the battle for Wheat supremacy, as Wichita State took on Kansas, which the Shockers easily won. If the Cats can win one more there is a good chance Wichita State will be waiting. More immediately I wanted to see how West Virginia and Maryland would go. West Virginia, the eventual winner, gets Kentucky Thursday at 9:45 PM EST, with a trip to the Elite Eight on the line. Coach Bob Huggins has a winning record against Calipari, but the Cats owe the Mountaineers for the loss they pinned on the John Wall-led Wildcats in 2010. For Louisville they get a regular season ACC game against conference foe NC State Friday at 7:37 PM EST. This will be a hard-fought game since both teams know each other well. The Wolfpack beat the Cards 74-65 in Louisville on Feb. 14. Both schools are playing hot hands – you just never know. The Sweet Sixteen doesn’t kick till Thursday night. In the meantime cautionary anticipation builds. I want to see the games, but not interested in tasting the agony of defeat. March Madness is upon us. There’s nothing to be done except to hold on and enjoy the ride. It’s awesome to have a team in the Big Dance, especially if they’re still balling deep into March. Honor their sacrifice and achievement. Root for them with gusto. Wear their colors proud. And dream about them cutting down the nets. This entry was posted in Events, News and tagged Iowa Hawkeyes, Kentucky Wildcats, Louisville Cardinals, NCAA Championship, NCAA Sweet 16. Bookmark the permalink.